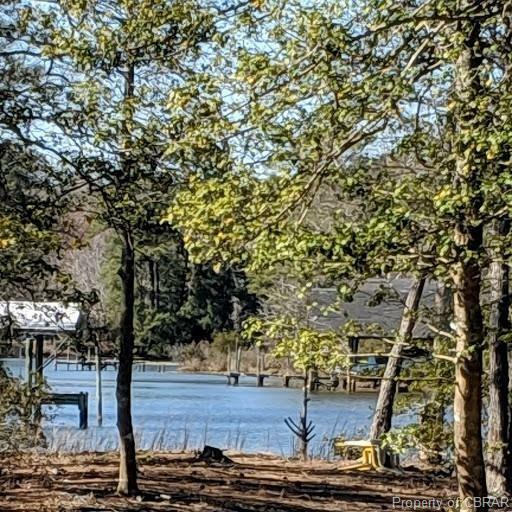 Extremely private waterfront get a way, super large garage doors for boats or campers, with three bedroom living area above. Waterfrontage on Morris Creek off Stutts Creek near Mathews Yacht Club not far from the bay. Not far from down town Mathews with restaurants, art galleries, shopping and more. Yet totally private and launch your kayak right off the shore of your own property. Spacious vaulted living area with new wood floors, large eat in area and custom tile bath and three bedrooms. Deck over looking the water. Additional 4 plus acre lot giving you over 8 acres for only $20k more. Directions: Mathews Ct. House Toward Moon, Left On Holly Point Rd Half Mile On Left, Sign.